I wasn't sure what I was in for when I started reading this memoir. What I did find was incredibly pleasant, for the most part. One problem many memoirs have is focusing too much on their childhood. Unless the famous person was a child actor, it really doesn't make much sense to focus on your formative years too much. Boyd does not do that. She uses her descriptions of her childhood to lay the groundwork for why she is the way she was and why she reacted to the later experiences the way she did. She focuses at least 3/4 of the book on the reason we are reading this book; that is, her experiences with musicians. 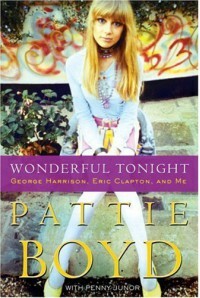 Next, Boyd holds nothing back on her emotions regarding her relationships with George Harrison and Eric Clapton. It was really hard not to empathize with her; however, I was surprised that she was so candid about still being in love with Harrison and regretting not fighting for his affection. However, I liked how she used her negative experiences with Clapton to avoid a repeat relationship with another alcoholic. Overall, this was well-written. It was quite obvious Boyd had some education by the fact that the English utilized was highly formal and grammatically correct in the extreme. At times it can be construed as cold by American standards, but I personally enjoyed it due to the authenticity of the writer and allowing for a voice to come through.